The issue of Hawaiian sovereignty was recently in the news when five members of the Polynesian Kingdom of Atooi group were arrested for assault and harassment after storming and attempting to occupy a government building in Honolulu. The men are part of the Hawaiian Sovereignty movement which does not recognize the United States Federal Government’s authority over the islands. The issue of Hawaiian Sovereignty is difficult to unpack made all the more complicated by the many groups and differing viewpoints, even among Native Hawaiians. In a nutshell, the Hawaiian Sovereignty movement says that the U.S. government was complicit in the illegal overthrow of the Hawaiian monarchy and the subsequent occupation of the islands. And, they assert that the article 73 of the United Nations charter says that Hawaii was to be placed under the administration of the United States with the purpose of making the islands self-governing. Hawaiian nationalists claim this “sacred trust obligation” was never carried out and that Hawaii was always intended to be independent. It is important to note that over 94% of the residents of Hawaii voted for statehood in 1959. In the 70s and 80s, when the indigenous peoples’ movements gained traction, Hawaiian Sovereignty came to the forefront of island politics. In 1987, activists occupied the land near Makapu'u Lighthouse on Oahu, claiming it as ancestral land. Eventually the dispute was resolved and the group was granted nearby land called Pu`uhonua O Waimanalo. They cleared the mosquito infested property and built homes where a couple hundred people live today. Most are Native Hawaiian and formerly homeless. On Kauai, Hawaiian Sovereignty became an issue when a couple dozen Native Hawaiians began camping on the abandoned Coco Palms Resort (this is where much of Elvis’ film Blue Hawaii was filmed). They claimed ownership of the land and said they had proof to support their position. Lawsuits were filed and in 2018 the Native group lost and were removed from the resort which is due to be renovated and reopened (it has been vacant since Hurricane Inika in 1992). You can’t visit Coco Palms Resort, it is fenced off as a construction site. But, you can take pictures from the street. Mark Zuckerberg became the face neo-colonialism in Kauai when he bought a 700 acre estate and used a third party shill to file lawsuit against fractional landowners of adjacent property which had been handed down over generations. The lawsuit was dropped after public outcry, but sale of the parcels was done amid protest in March, 2019. Around Kauai you can still see symbols of Hawaiian Sovereignty. An upside down Hawaiian flag is one. 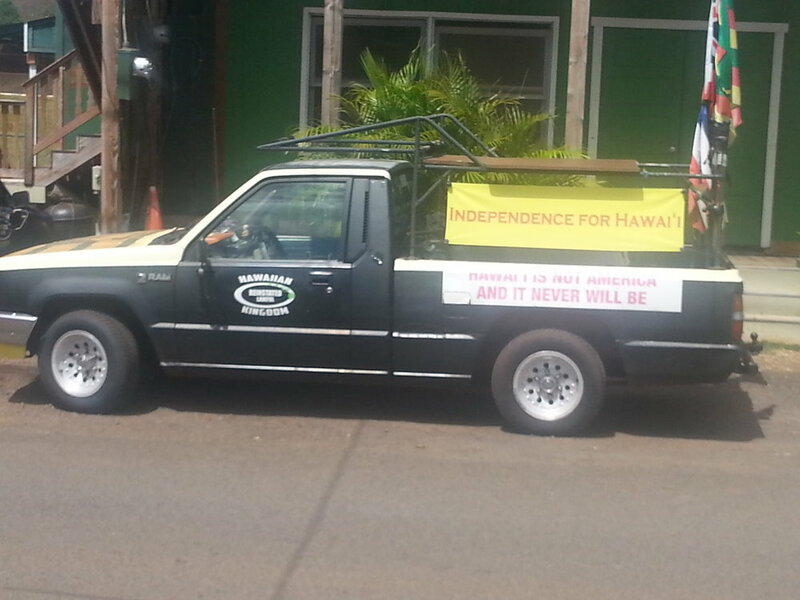 Or, the signs proclaiming independence on these trucks we saw in Hanapepe.